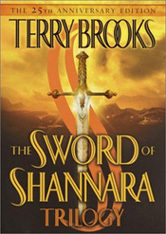 The Sword of Shanara Trilogy by Terry Brooks is an easy to read, engaging fantasy adventure. The author’s writing starts of rather poor with annoyingly short sentences and repetitive descriptions that disrupt the flow of the story, but it gets better after the first book. He doesn’t use any bad language or write anything obscene in these first books. However, his characters do become more intimate in later books. Brooks’ creates an amazing in-depth world for his books, writes fantastic battle scenes (a few in each book), and the story is well paced, intriguing, and not very violent. Even though his story is rather predictable he still managed to keep me interested. It is said by many reviewers that this trilogy is similar to Lord of the Rings. I believe that Tolkien was his inspiration and he wanted to attract the readers who loved Tolkien’s fantasy. Many fantasy books written after Tolkien are going to have some likeness to Lord of the Rings. It’s to be expected. His characters are not as well developed as they could have been. I learned to like his characters and they were believable, but I did not absolutely love and care for them as much as I would have liked. An interesting aspect of his books is that many of the characters after the first book are decedents from characters in the previous book. It was unique to keep characters in the same family line for hundreds of years within his series. Even though I only liked his characters, I loved his creatures, especially the Moor Cat and the creatures from inside the forbidding. I really enjoyed these books and many of the ones that followed. If you enjoy this trilogy, then I would suggest reading through his series until after the Jerle Shannara books. The books that follow are not as good and seem to be the same plot written with different characters. I also skipped any pre-shannra books and just read Sword, Heritage, Jerle, and some others. These first three books are very suitable for anyone 12 or older, but some consideration should be taken for the others in the series. Although I liked these books, I believe I would have enjoyed them a lot more as a teenager since it seems to be more for early fantasy readers. I tend to like more unpredictable and in-depth stories. World of Shannara is the companion book to the Shannara series. It includes maps, pictures, and more information about places, events, and people. It is a must have! I loved it! Yes, I was lucky to have found them when I was a teenager. Once I had matured as a reader, I liked him less. He’s not awful… Just middle of the road. I agree. I also found out after reading most of his other books in this series that he reuses his plots to the point where it became annoying. I may not have picked up on this as much if I would have read them when I was younger. Still, I am glad I read these books and I have to say that the first three will always be my favorite.